The Air-King is one of the least-discussed models in the Rolex catalogue, yet it is one of Rolex’s oldest lines of watches with a rich and unique history that dates all the way back to 1945. Although the Air-King has never traditionally been fitted with any specific features or complications, it has always represented an entry point into Rolex ownership, with its legendary reliability and minimalist feature-set. The Rolex Air-King first began its existence after Rolex co-founder, Hans Wilsdorf heard stories of British World War II pilots ditching their standard-issue, field watches in favor of their personally purchased, Oyster Perpetual timepieces, due to their superior accuracy and dependability. To honor the brave RAF pilots who were so fond of his products, Wilsdorf decided to release a series of watches with aviation-themed names. Despite the numerous different lines of watches that were released to market, only the Air-King remained in production, and can still be found in the Rolex catalogue today. The very first Rolex Air-King from 1945 was the reference 4925, which combined a number of different traits that were characteristic of Rolex’s other various aviation-themed watches. A small number of Air-King references quickly followed the reference 4925; however in 1957, Rolex released a new generation of the Air-King, the reference 5500, that would go on to remain in production for the next 37 years. 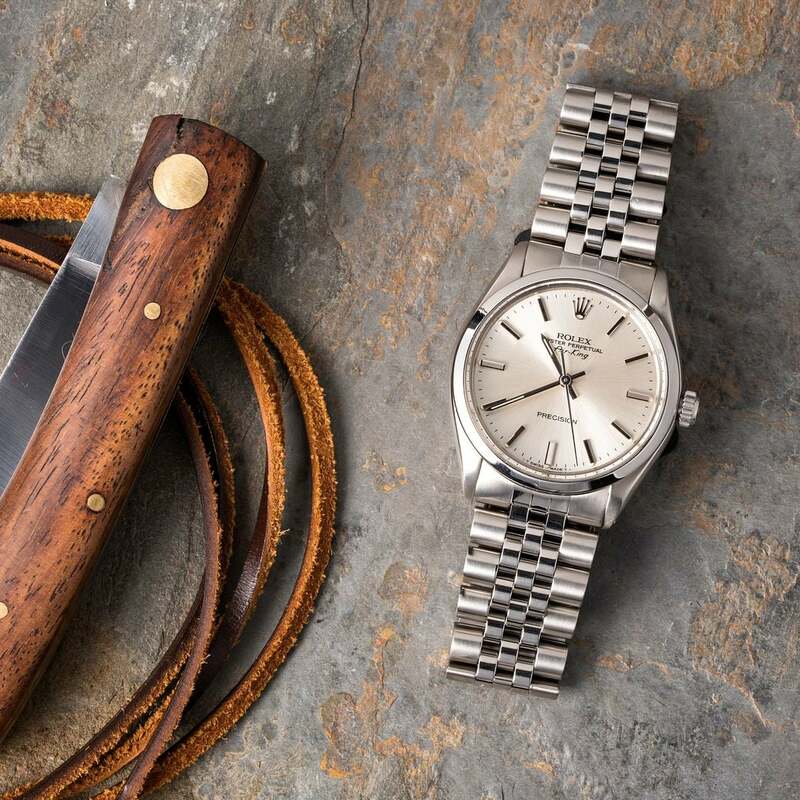 The reference 5500 used a 34 mm stainless steel Oyster case, which was fitted with a thick acrylic crystal and a matching stainless steel Oyster bracelet. Depending on the year of production and country in which the watch was sold, the reference 5500 Air-King was fitted with either Rolex’s caliber 1520 or caliber 1530 movement. Despite the difference in movements, none of the reference 5500 Air-King watches were chronometer certified, and consequently none had the “Superlative Chronometer Officially Certified” text appear on the surface of their dials. The most recent incarnation of the Air-King, the reference 116900 has far more in common with the contemporary Rolex Milgauss than any of the previous Air-King generations. 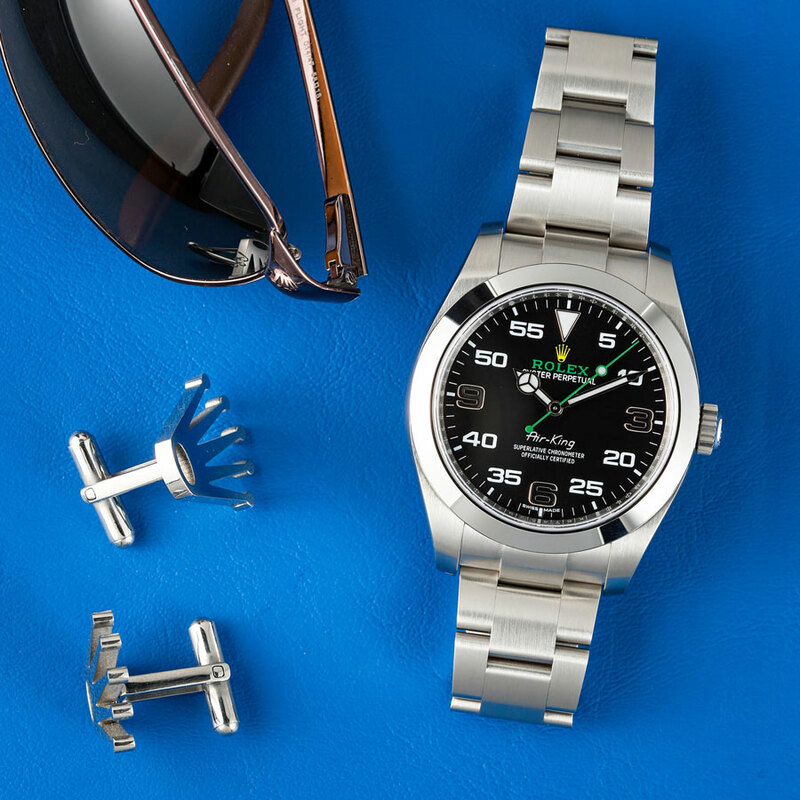 The 116900 shares a 40 mm stainless steel case with the Milgauss, and even uses the exact same, internal movement shield craft from ferromagnetic alloys, which provides the Milgauss with its legendary, anti-magnetic properties. While the Air-King still remains a time-only watch, the reference 116900 is now fitted with a scratch-resistant, sapphire crystal and has the “Superlative Chronometer Officially Certified” text appear on its dial to match the rest of the watches in the contemporary Rolex lineup. In addition to the new COSC-related text, the dial on the reference 116900 Air-King now features bright yellow and green highlights, along with white text and white gold hour markers for a thoroughly modern overall appearance. The movement inside the reference 116900 Air-King has also received an update, and now shares the same COSC-certified, caliber 3131 movement that is used to power the contemporary Rolex Milgauss. The caliber 3131 uses Rolex’s proprietary, blue Parachrom hairspring, and an escape wheel and pallet fork made from nickel-phosphorus, which further increases the watch’s overall resistance to potentially disruptive magnetic forces. The Rolex Air-King has historically represented an entry point into Rolex ownership, and has allowed individuals to have access to the Rolex’s legendary accuracy, reliability, and prestige without any additional features or complications. While the modern Air-King is a significantly different timepiece than the reference 5500, and an even greater departure from the original wristwatch that Hans Wilsdorf released to the public in 1945, the reference 116900 is a modern reinterpretation of a Rolex classic, which has been updated with anti-magnetic capabilities to better contend with contemporary day-to-day life.